MDS Trucking is a leading Chicago trucking company specializing in dry and specialized freight transportation services. 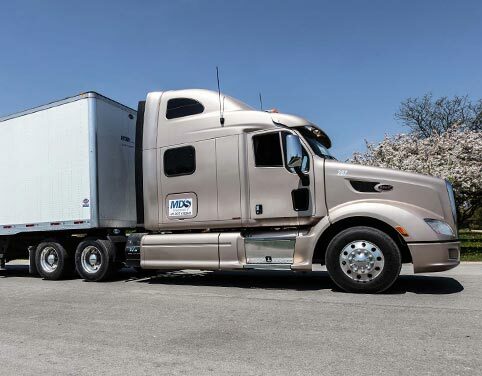 By utilizing technology customized to our customers' needs, we deliver hundreds of on-time shipments daily throughout the Continental United States. In collaboration with outside and affiliated agencies, our safety managers and pricing professionals are experts in all regulatory changes and DOT requirements. Our entire fleet of tractors is equipped with Automatic On-Board Recording Devices (AOBRD), ensuring real-time freight tracking, as well as optimum performance and safety monitoring. Keeping in mind quality of our services at all times, we are always looking to expand. One of the key reasons for our success are of course – our drivers. We are constantly looking for experienced drivers, who know their way with the vehicle and have a great PSP records. If you want to join our team – you are at the right place! If you are interested in pursuing any of our exciting, unique offers, please call our recruiting team at 224-521-0166 or email recruiting@mds-skyway.com today! You may also apply online and someone will reach out to you within 24 hours. NO LONG-TERM COMMITMENT! MAINTENANCE INCLUDED! The key point of our success are our employees. This is why we are offering the best working conditions in the industry and why we keep our drivers constantly motivated. Apply today and find out why people enjoy driving for MDS. MDS Trucking V, Inc. | Skyway Brokerage, Inc.